I looked forward to Thursday night..always a good laugh! The next day at lunch in the Faculty Room we would rehash the episode. So tonight, in honor of so many Seinfeld funny episodes, we had the BIG salad! 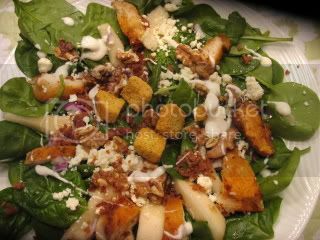 Baby spinach, red onion, chicken, feta, fresh pears , walnuts,bacon and croutons, an all on one plate dinner..
A scene from my neighborhood...soon the dock will be filled with boats..but right now, it is very quiet here! That is ONE BIG SALAD !! I used to watch the Seinfeld re-runs all the time - never tire of them! The salad looks fantastic and is a meal in itself. The dock looks very inviting even though the water is probably so cold.. at least no ice!! 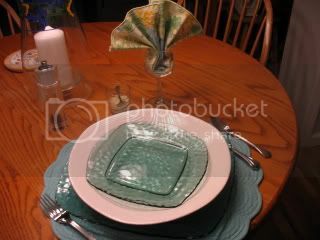 I like that as a meal..:) And no ice or snow where you are..Summer cannot be taht far away~ Sigh,,it's snowing here. Great looking BIIIIIG salad, Kathleen! and funny post! I can just picture J sitting down and chuckling to himself while he ate that snickers, LOL! Enjoy today, we're supposed to get spring! Great BIG salad! It's got all things I love. Seinfeld was a favorite of mine too. I was sad to see it go. The dock looks so peaceful Was that today? I hope so..looks nice. It's 52 here and just 10 so we are in store for a nice warm day. Maybe all the way up to 70! Yayyyy! I loved Seinfeld too and the diner! Your Big Salad looks delicious. I'm thinking salad for dinner here tonight too as we await our 3-6 inches of new snow :( Pretty picture of the dock. Kathleen, love the dock picture, the blues are gorgeous. THE BIG SALAD sounds delicious. I definitely remember that episode. Sounds like your principal had a great sense of humor. Kathleen, your weather is nicer than ours! 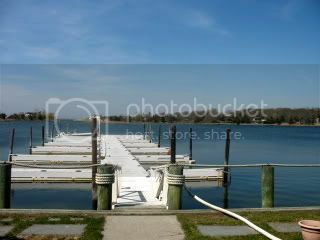 That is a great dock picture, love the color of the water. Makes me wish harder for summer. We like THE BIG SALAD too! That salad looks so good! We often have a BIG salad for our meal. Love the dock pic. Thanks for visiting, Kathleen. This post could easily serve for a Blue Monday. You and I have much in common; I am a retired public school teacher too. I taught high school English. What did you teach?